Very General Remarks on Freyre: Having studied anthropology in the US (where he was mentored by Franz Boas), he returned to Brazil in 1923, becoming a sociological expositor of modernism - writer of anthropological-historical treatises full of asides, the printed tracks of Brazilian personhood, and a panoply of jarring writing styles, he also produced novels and polemics. The inherent contradictions are projected in the title of his autobiography, Como e porque sou e nāo sou sociólogo (How and why I am and am not a sociologist, 1968). It contains chapters such as 'Why I'm a writer without ceasing to be somewhat sociological'. 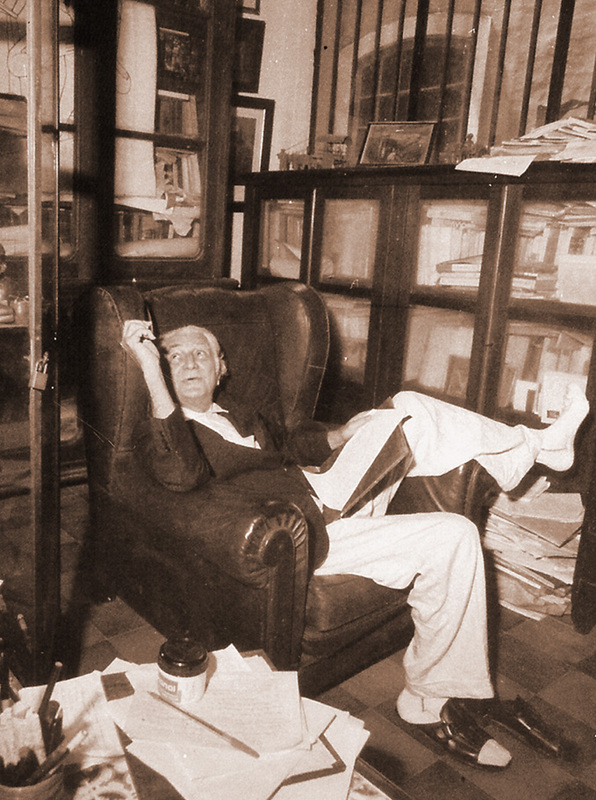 Freyre's Casa Grande e Senzala (The Masters and the Slaves, 1933) was seen as radical - Antonio Candido, remembering his teenage generation of the 1930s, spoke of "the revolutionary force, the liberating shock" of Freyre's book; its readings of the colonial period and of an originary Brazilian racial culture were subsequently demolished in the 1960s. Since then his reputation, as sui generis essayist on Brazil, in particular a source of insights on Brazilian patriarchy exemplified in two famous later books, Sobrados e Mocambos (The Mansions and the Shanties, 1936) and Ordem e Progresso (Order and Progress, 1959), has revived, though it still polarises. "His boosters call Freyre's oeuvre an histoire-fleuve; liken him to Tolstoy, Balzac and Joyce; call him a poet; and hail him as a founder of meta-literature", is the acid account of Richard M. Morse in his chapter, 'The multiverse of Latin American identity c.1920 - c. 1970' in The Cambridge History of Latin America: Latin America Since 1930 - Ideas, Culture and Society Vol 10 (The Cambridge History of Latin America), edited by Leslie Bethell, (1995). I was interested in this attack as Morse then places Freyre half-way between Durkheim and Proust, an exciting place to be, at the time perhaps, though he adds in parenthesis: "Proust's world of memory was released by a single petite madeleine soaked in tea. Freyre would have described sixty Pernambucan sweetmeats and a dozen types of maté" (pp69-70). A jest but Freyre's style is accurately pinned here, for he does continually delimit the patterns - the manipulation of factors of production - of analysis by allowing a catalogue of some kind to brim over so that antagonisms, entropy and transformations - the objects of study in the trilogy of books listed above - are themselves unsettled. Morse allows this point: "Freyre touches imaginations in Brazil and elsewhere by eschewing academic sobriety in favour of long-winded, ingratiatory, often saucy inventories of contraband information." The put-down of saucy here refers to Freyre's bare descriptions of the sexual exploitation of slaves. "Portuguese wet nurse with three months' milk, married, good references; apply Rua general Polidoro, No. 177, Apartment No. 1"; "Portuguese wet nurse, five months' milk, healthy and affectionate, will submit to examination; Rua da Gamboa, No. 117, upstairs"; "Portuguese wet nurse, seven months' milk, reference from Dr. Moncorvo, apply Rua Marechal Floriano Peixoto, No. 191 (new numbering), upstairs"; "Spanish girl wishes eployment as dry nurse, recently born child preferred, apply Rua do Santo Cristo, No. 112"; "Available, with one months' milk, Portuguese, Rua Macedo Sobrinho, No. 21, second door, Largo dos Leões"; "Portuguese girl seeks employment to wash and iron for a reliable family; Rua de S. Cristóvão, No. 36, apt. 14"; "Portuguese maid-of-all-work; Rua dos Inválidos, No. 145, apt. No. 12"; "Recently arrived Portuguese girl available as cleaning woman, live out, Rua da Imperatriz, No. 120"; "Perfect laundress, Portuguese, foreign family preferred; Avenida Ipiranga, No. 6, Laranjeiras"; "Japanese chef, cook, and baker, Rua Sãa Clemente, No. 216"; "Good Chinese cook and baker, Rua do Lavradio, No. 53"; "Italian cook, knows French and Brazilian cuisine, pastas, and desserts; Rua da Lapa, No. 12, bakeshop"; "Good Portuguese landscape and vegetable gardener, good-conduct card, Largo da Miseracórdia, No. 12." The list exceeds any moderate practise of "historical sweep" in his use of source material: the more adverts there are, the more these people stand ready with their labour, their milk on the page, a specific geography and time, "new numbering";- the more it is suggested that this reading of the entire section repeats the reading of those looking for domestic help, the other comprehensive readers of this list, and in this manner Freyre does disrupt the potentially blank, indifferent space of historico-transcendental thematic - always threatening to engulf his work -, doing so by means of public prints which gain interiority through their distance from the moment of reading.